It’s time again for Mixology Monday. This month’s theme is Smoke! and it comes courtesy of Elana over at Stir and Strain. We’ve been wanting to noodle around with smoke infusion for a while now, so this was a perfect excuse to do so. We started out by burning various ingredients and mixing the smoke with dark rum. We would light various things on fire, and then place the metal half of the Boston shaker over them to collect the smoke. Then we’d swirl/shake the rum with the smoke. This imparted a decent amount of smokey flavor into the spirit without too much effort. We tried cinnamon sticks, black peppercorns, and whole cloves. With the exception of the cinnamon, they ended up being too subtle or not quite what we were looking for. Julia suggested we try smoking some tea and see what we got with that. We tried black chai tea, making sure to include a cardamom pod, and that imparted smoky/spicy flavors that were more in line with what we were looking for. After tasting the results with the rum, Christa felt that bourbon would be a better match spirit-wise. So we started with the smoked bourbon as a base and started assembling a cocktail. Put all ingredients in a mixing glass. Stir with ice and strain into a glass. Garnish with a brandied cherry. * Chai Smoked Bourbon: Place a small amount of black chai tea on a fireproof surface. Light on fire. Place the metal half of a Boston shaker over it. Pour 2 oz bourbon into glass half of shaker. After sufficient smoke has accumulated, put 2 halves of shaker together. Gently shake for approximately 30 seconds. Nose: Subtle smoky notes, vanilla and caramel notes from the bourbon, strong mineral notes like warm stone or concrete. Palate: Bourbon, smoke and chamomile on the front, followed by a little bit of green herbal bite in the middle supported by honey and date flavors from the malaga. More bitterness at the end, with a slight resurgence of smoke and some slight camphor notes. It’s a cool, blustery day here in Seattle, and the Hearthstone is just the ticket to provide a smoky, spirituous warm-up. Thanks again to Elana for the nudge with this month’s theme. We hope you throw one together to enjoy the next time the fire is crackling and the rain is coming down. Update: Check out the round up to see the other awesome entries. 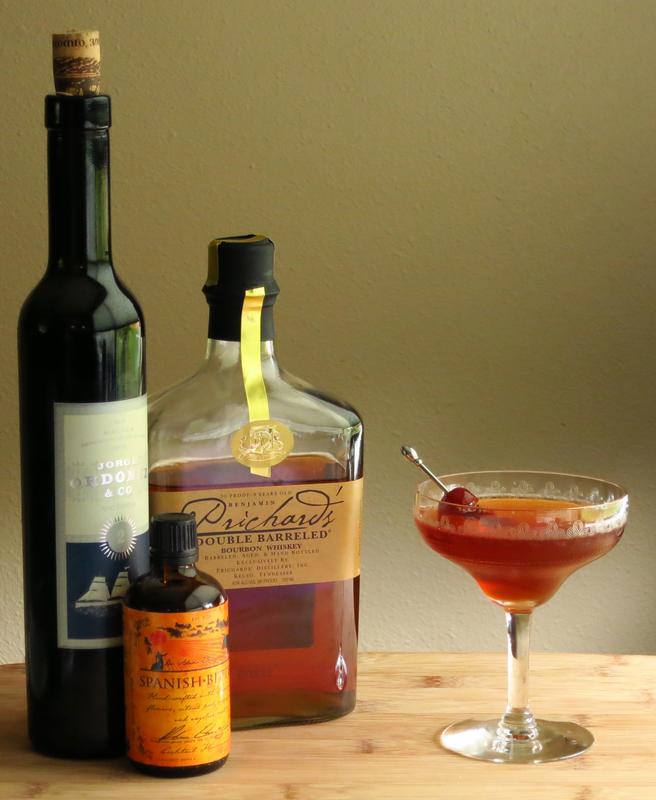 This entry was posted in benedictine, bourbon, malaga, Mixology Monday, Original Cocktail and tagged hearthstone cocktail recipe, Mixology Monday, Prichard's Double Barreled Bourbon. Bookmark the permalink. Hell, if it gets below 70 here in Los Angeles I will DEFINITELY have one of these guys. Great post! Lucky you. 🙂 Thanks! And thanks for hosting.